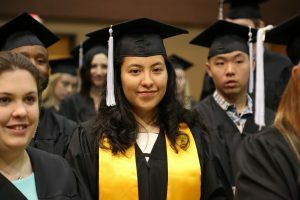 Warner Pacific University is the first four-year college or university in Oregon to receive designation as a Hispanic-Serving Institution by the U.S. Department of Education. Warner Pacific earned the Hispanic-Serving Institution (HSI) designation after meeting enrollment criteria from the U.S. Department of Education that requires over 25 percent of full-time students identify as Hispanic or Latino. 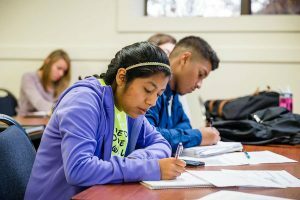 With 30.1 percent of its student body identifying as Hispanic or Latino, Warner Pacific University is the first and only bachelor-granting HSI in Oregon, and one of only twelve HSI-designated institutions in the entire Northwest. The HSI designation is a public recognition of the intentional work that Warner Pacific has been focused on for more than a decade. In 2003, just 13 percent of students at Warner Pacific identified as people of color. Today, 63 percent of the student body comes from racially and ethnically diverse backgrounds and 57 percent of students are the first in their family to attend college, making Warner Pacific University one of the most diverse higher education institution in Oregon. Warner Pacific understands that equitable access to higher education requires more than just diverse enrollment. That is why the University provides personalized attention and support, with class sizes that average 12 students. Earlier this year, Warner Pacific made earning a degree even more attainable when they announced a 24 percent tuition reduction in their traditional undergraduate program, making it the most affordable private institution in Oregon. The HSI designation benefits all Warner Pacific students, as it opens the door to scholarships for any student who attends an institution that is a member of the Hispanic Association of Colleges and Universities (HACU), regardless of race or ethnicity. Federal agencies that provide grants and scholarships to students attending HACU institutions include the departments of Agriculture, Education, Health and Human Services, Housing and Urban Development, and the National Endowment for the Humanities.